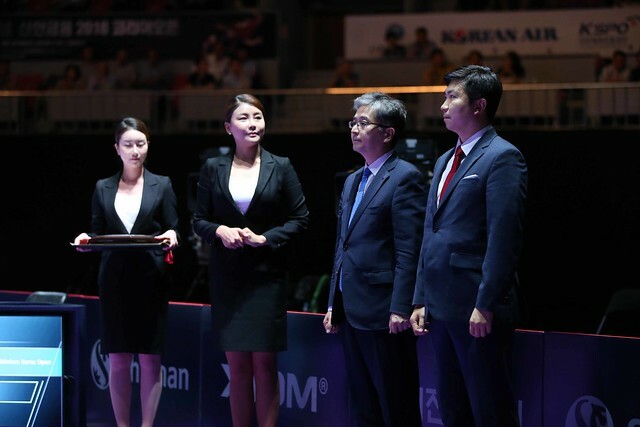 The Seamaster 2018 ITTF World Tour Platinum Shinhan Korea Open has arrived and in some style too with a host of big name stars suffering early departures across the two singles events while the involvement of United Korea doubles partnerships also took the spotlight on Thursday 19th July. Here’s a summary of the day’s highlights from Daejeon. Arguably the largest number of shock results on day one came courtesy of the Women’s Singles competition including an early exit for last year’s Champion Feng Tianwei, who fell to a six games defeat at the hands of qualifier Miyu Kato (11-6, 11-13, 11-7, 9-11, 11-6, 11-8). Further upsets came from Miyu Kato’s fellow compatriots; known for her ever-reliable control and defensive game Honoka Hashimoto recovered from an early deficit to see off No.10 seed Chen Xingtong (2-11, 11-8, 11-9, 15-13, 11-6) while Saki Shibata was responsible for seventh seed Miu Hirano’s opening round exit (13-11, 7-11, 7-11, 11-7, 11-1, 15-13). Hong Kong’s Doo Hoi Kem will play no further part in the Women’s Singles draw following her straight games defeat against China’s Hu Limei (11-5, 11-7, 11-3, 11-4) but there was no such drama for top seed Chen Meng, who sailed into the second round with little difficulty. While Japanese competitors may have been making the headlines for the right reasons in the Women’s Singles tournament it was the unexpected exits of two of the country’s stars that caught the eye in the Men’s Singles category with Koki Niwa and Kenta Matsudaira both experiencing defeat. Despite holding a two games to one lead, sixth seed Koki Niwa failed to capitalise on his advantage against Korea Republic’s Jeong Sangeun (10-12, 11-5, 10-12, 11-8, 12-10, 11-7). Similarly, Kenta Matsudaira, seeded 11th, also held the upper hand in the early stages of his Round of 32 encounter with Ham Yu Song but ultimately it was the qualifier from DPR Korea who emerged from the tie victorious (12-14, 11-5, 11-8, 11-4, 11-7). Dimitrij Ovtcharov marked his return to international action with a comfortable win over French opponent Enzo Angles (11-5, 11-8, 11-9, 11-8) to set up a meeting with Jun Mizutani in the next round. Along with the two singles events, day one also hosted action from the three doubles competitions which all featured partnerships representing a United Korean Peninsula team. In the Mixed Doubles draw there were two victories for the team to celebrate: Jang Woojin and Cha Hyo Sim pulled off a mighty effort to beat the second seeded duo of Wong Chun Ting and Doo Hoi Kem (8-11, 11-8, 11-9, 11-8) before eliminating No.5 seeds Ho Kwan Kit and Lee Ho Ching at the quarter-finals stage (13-11, 11-4, 11-8). The pairing of Kim Song I and Suh Hyowon came close to an upset in the Women’s Doubles event, pushing third seeds Wang Manyu and Zhu Yuling right down to the wire (10-12, 11-5, 3-11, 12-10, 11-9) while Lee Sangsu and Pak Sin Hyok prevailed against Patrick Baum and Thomas Keinath (11-4, 11-5, 11-4) to reserve their sport in the last eight.